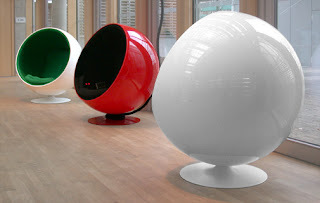 I mentioned in my last post that finally a ball chair is within my grasp. I have been lusting after this 1966 Eero Aarnio design for some time. Now the only thing holding me back is colour choice. 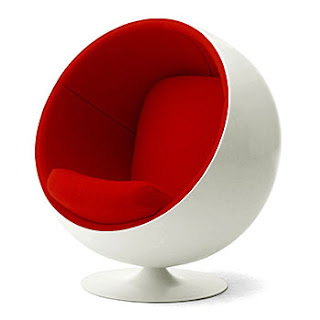 I'm pretty sure I'm going to go for the classic white shell/red interior because I'm going to also get some tulip dining chairs (which are easier to find in red/white). However, I also wonder if this will be too much red and white so for now I'm holding off until we're inside the new place with all our other furniture. The colour options seem almost endless which inevitably leads to difficult decision making for me. We move in this weekend! I am SO jealous!! You are a lucky girl! That solid orange one is aMAAAAAAAAAzing. (I can't quite seem to get off my orange kick, no matter how hard I try.) Good luck on the move-in! Oooo aaah I'd get the red and white! 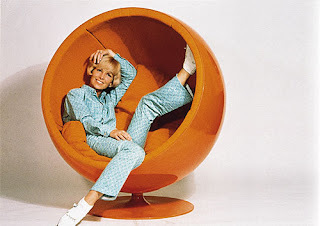 Reminds me of the seats they had at Disneyland CA, Journey Thru Inner Space. Sort of lol.